Dr. Nguyen Hoang Lam graduated from Pham Ngọc Thạch University of Medicine in 2012. He then continued with the Specialty Orientation for Ophthalmology at the same university in 2013. From there, Dr. Lam got his Master of International Ophthalmology at The University of Sydney which was completed in this year, 2017 with an essay titled "Spectrum of new patients presenting to a tertiary glaucoma unit in Vietnam", afterwards published on 23 October 2018. 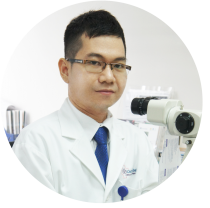 Prior to joining Cao Thang Eye Hospital in September 2017, Dr. Lam worked in the Department of Ophthalmology in Thanh Mau Hospital and An BInh Hospital. During his professional practice he has participated in Phaco and YAG laser in Ophthalmology training in 2016 at the Ho Chi Minh City Eye Hospital. Dr. Lam is proud to be a translator at Orbis International Vietnam in Ha Nội, 2015 and in Can Tho and Qui Nhon, 2017. Dr. Lam’s objective is to become a specialist of Glaucoma & Pediatric care in the future.